What does a Virtual Cloud Desktop Provide? Any Device. Anytime, Anywhere Access to your desktop. Our Virtual Desktop delivers a complete desktop solution from the cloud, providing all the benefits of virtualized desktops without any of the hassles. 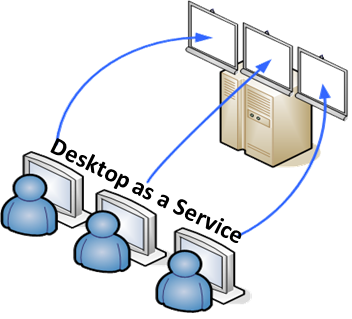 The Virtual Desktop service eliminates the cost and complexity of deploying and managing your employee desktops. We enable small businesses and enterprises to rapidly provision desktops to users on any device, anywhere, anytime without the up front costs and complexity of a traditional desktop. Our Virutal Desktop service allows you to use any device to connect to your cloud desktop – from your existing PC, laptop, smartphone, or tablet computing device. Our technology allows you to connect to your Virtual Desktop anyway you want – Public IP, IPSEC, VPN, MPLS or point-to-point. in use today into our Virtual Desktop Infrastructure (VDI) cloud. You can run most applications you run on your PC on our cloud – from Microsoft Office, to ERP and web applications, to Adobe Photoshop. we have built a state-of-the-art infrastructure that offers high availability and a 99.9% uptime guarantee. Our flexible architecture allows our Virtual Desktop service to integrate into your existing network and with existing servers, firewalls, or appliances; allowing you to deploy your virtual desktops and leave our servers in-house. Enhance and increase application performance, computer uptime, and speed by moving to our Virtual Desktop Infrastructure (VDI) Service. Extend the life of your existing PC’s by moving the processing to the cloud. Eliminate the headaches of PC refresh cycles and convert your unpredictable desktop expenses to predictable expenses. Improve security by safeguarding important company information, thus ensuring that lost laptops won’t lead to lost confidential information. Pay only for the desktops you use, with easy to understand pricing model with no surprises. Pricing starts at $69.50* per month per seat.